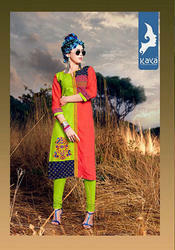 Kaya has launched new catalog "orange-2"
We are the Leading Supplier, Trader and Wholesaler of Kaya Kurtis in Chennai, Tamilnadu, India. We here by bring for you an astonishing range with Designer Cotton Kurtis as per lates design and trend by Trisha at much reasonable prices. Cotton Cambric Print Heavy Quality, Concept :- Anarkali Pattern, Length :- 45"Flair :- 45"